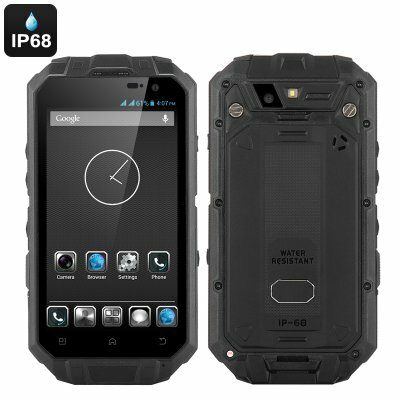 Successfully Added Rugged IP68 Android Smartphone 'T3S' - 4.3 Inch QHD Smart Touch Screen, Quad Core CPU, 1GB RAM, 13MP Camera, Android OS (Black) to your Shopping Cart. The 'T3S' Rugged Android phone has a 4.3 inch display a quad core CPU, ip68 Rating and 13mp camera as well as smart-touch. With a 4.3 inch display this pocket friendly phone packs a punch as has an IP68 rating to ensure its waterproof, dust proof and shockproof. With a QHD capacitive screen you can see and interact with the device splendidly and the smart-touch technology means that even with gloves on it will detect your fingers movements on the display. So when you’re out in the cold and wet you don't have to expose your fingers to interact with this device. Another great feature is the 13 MP rear camera, which is a real delight and welcome addition to a phone that's designed to go with you everywhere. There is a dedicated camera button so snapping shots is always easy ensuring you won’t miss those once in a lifetime photos from far flung places.